I can’t believe it’s already the last day of the year. My first year of blogging has come to a close! (Although I really only started a few months ago) I’m excited to see what the new year will bring in this and every other way. 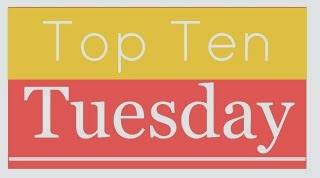 For now, this weeks Top Ten Tuesday, hosted by The Broke and the Bookish reflects back on the ten best books of the year. 1. The Guernsey Literary and Potato Peel Pie Society by Mary Ann Shaffer: Okay so I just finished this on the second to last day of the year but it still is easily one of the best books I’ve read this year, I actually may have hugged it when I finished, and I CANNOT believe it took me so long to get around to it! 2. Tell the Wolves I’m Home by Carol Rifka Brunt: I have so much love for this book, I recommend it to everyone and I will definitely be re-reading it next year/forever. 3. Fangirl by Rainbow Rowell: I’ve written about this ad nauseam at this point, but I will not get tired of recommending it or singing its praise. 3A. Eleanor and Park by Rainbow Rowell: Cheating a little and combining the authors but I couldn’t leave out Eleanor and Park, it would just be wrong. This book had me crying my eyes out at two in the morning, and it deserves all the hype and buzz it’s gotten this year! 4. Miss Peregrine’s Home for Peculiar Children by Ransom Riggs: This isn’t the type of book I would normally be drawn to, but it reeled me in and I’ve been anxiously waiting for the next one since August! 5. The Shades of London Series by Maureen Johnson: More books I feel like I’ve put on many lists, but again, I love them so much that I can’t help it! 6. Divergent by Veronica Roth: Another one I can’t believe I waited so long to get around to reading, I will be starting 2014 with Insurgent! 7. The Paris Wife by Paula McLain: I fell in love with the writers of the Lost Generation all over again this summer between this and Z and this was definitely one of my favorites in that area. 8. Glaciers by Alexis M. Smith: I read this so early in the year that I ALMOST forgot about it. Taking place in just one day, Glaciers is such a simple but beautiful book, and another one that I will definitely be re-reading. 9. Where’d You Go, Bernadette by Maria Semple: I was never a fan of epistolary novels, but between this and The Guernsey Literary and Potato Peel Pie Society, I have changed my ways. 10. Will Grayson, Will Grayson by John Green and David Levithan: Another early read, but this had me laughing out loud and falling in love with John Green all over again, and with David Levithan for the first (but definitely not last) time. I loved The Paris Wife! And I’m waiting to read Miss Peregrine’s Home for Peculiar Children, I just went on a ‘creepy/neogothic’ book binge, and I’m a little burned out, but I want to read it so badly. I can definitely see how books like that could wear you out. I don’t generally read those, but Miss Peregrine wasn’t as creepy and sad as I was expecting from the cover! They are definitely two of my favorites too, I really just love anything by John Green though really. And Rainbow Rowell is just as amazing as everyone makes her out to be! Fangirl is definitely worth getting and reading; Such funny, relateable writing! Potato Pie… was good. Welcome to blogging, the first year is always exciting and can be overwhelming with all the books you will add to your Wishlist. Thanks! I’ve noticed my “to read” pile has grown significantly over this year already! The only one I’ve read is Bernadette (I am one of the very few nonfans) but I want to read most of the others on your list! Happy reading in 2014! You have some STELLAR choices on this list, my dear! Where have you been hiding? I shall now commence mild stalking. Haha why thank you! 🙂 I’m relatively new!